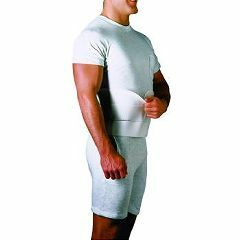 The DeRoyal Abdominal Binder is segmented plush-backed elastic and Uni-Foam panel with hook and loop closure. 3" wide panels of segmented elastic create form-fitting, breathable support. White. To size, measure hip circumference. I use this product for back support. Allegory Medical is a great company &amp; this is the only time they've sent me the wrong item. Item is in long term use to hold the abdominal wall due to surgery. Most similar to ones used in hospital. Lightweight. Easy Storage. Safe. soft. i use daily for blood pressure issues and back support. Been trying to find a binder for my "quad belly" that doesn't leave marks and has decent durability. My question on this product is where do you measure? At your waist or the largest point on your abdomen? Your belly button? It seems to be a big difference between small and large. Also wearing every day for 10 or 12 hours anyone experience marks or break down? Thanks! Asked on Apr 19, 2012 8:41:50 AM by hank from meredosia il. No, In my opinion, I do not believe it will help back pain. Asked on Dec 26, 2011 12:13:53 PM by Dale from Missoula,Mt.